Sliding mirrored doors are readily available for closets but for those looking for swinging closet doors, they tend to be harder to find…until now. Elite Mouldings can add mirrors to any of the hollow moulded core doors that we sell. You may order just the door slab or have us pre-hang it for you. 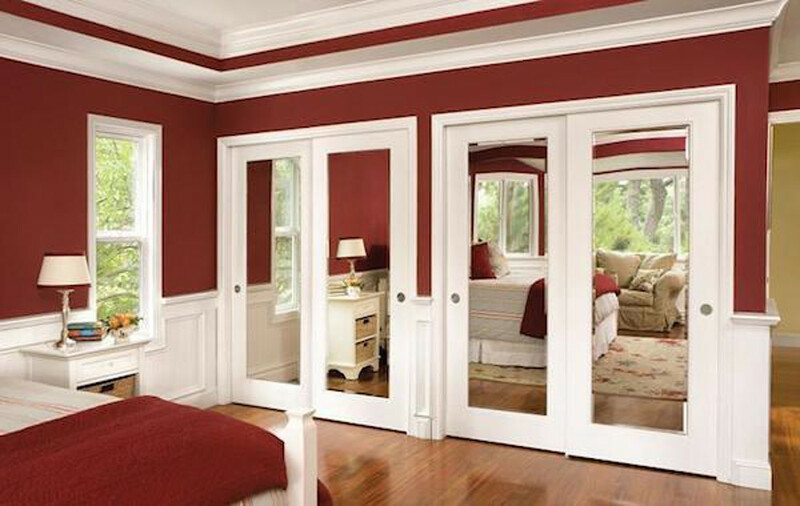 Mirror Doors are an excellent choice for bedrooms, bathrooms, closets or in rooms that need the feel of a larger space. Mirrored doors provide an excellent transfer of daylight and at night reflect ambient lighting in your home to create a relaxing space. We offer both single and double sided mirror doors. Mirrored doors can be inserted into most French door styles, as well as any of our Solid Rail and Stile doors with both bevelled glass and flat glass options. They come in both Paint-grade or Stain-Grade finishes.